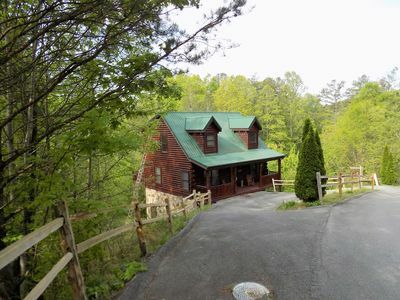 A fun-filled family retreat awaits you at this 2-bedroom, 1-bathroom Sevierville vacation rental cabin near the Gatlinburg arts and crafts community. 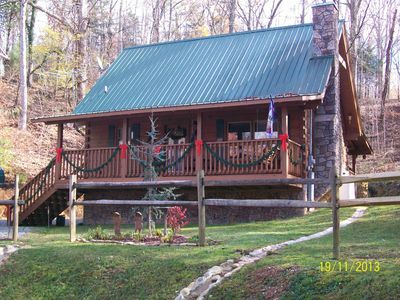 This cozy cabin comfortably sleeps 4 with room for 2 more, and houses all your essential amenities for a comfortable Tennessee getaway. 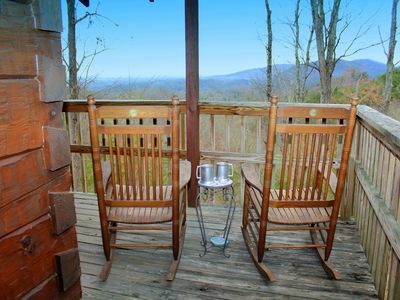 From the back deck, you’ll enjoy wonderful woodsy views with Mount LeConte as the backdrop. 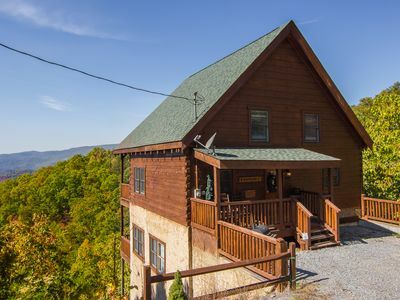 The property is ideally situated only 20 minutes from all the area’s greatest attractions, including Gatlinburg, Pigeon Forge and the renowned Dollywood! Booking a last minute trip? Call Evolve directly to secure your dates! 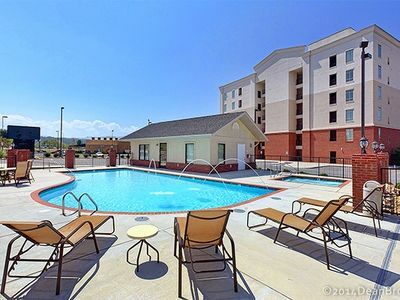 Start your vacation off with a view! 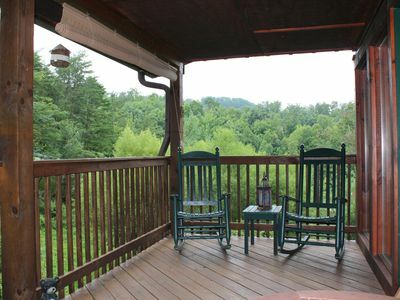 Check out the large deck tucked behind the cabin for stunning scenery and a refreshing spot to relax and recharge. This tree-lined outdoor space comes equipped with patio furniture and a charcoal grill. Enter inside through the french doors that lead into the den. 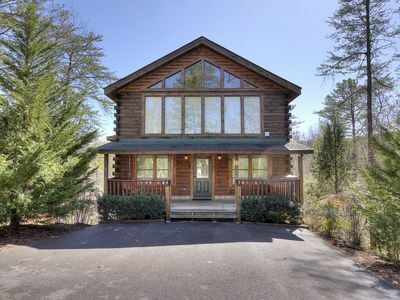 Floor-to-ceiling windows line the room, bringing in natural light and sweeping views. 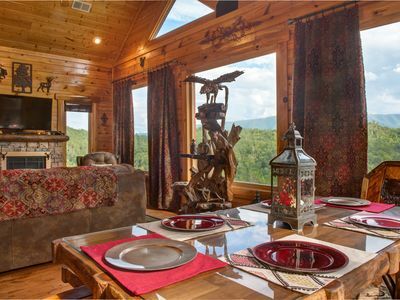 Mountain-themed decor fills the space, along with plush furnishings and a flat-screen cable TV. 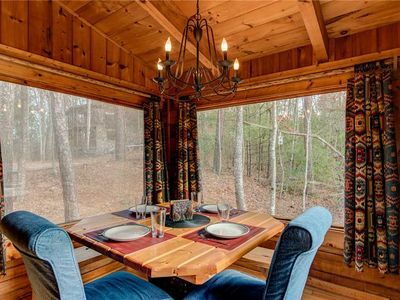 Off the den lies the fully equipped kitchen, complete with all your essential cooking appliances and a dining table set for 4. 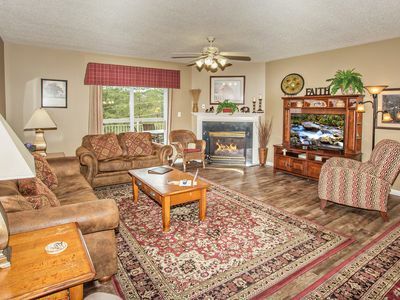 If you’re not quite ready to call it a night, gather in the warm and welcoming living area to share stories from the day. The room includes a leather loveseat and matching armchair set around a wood-burning fireplace. Settle into the queen-sized bed in the master bedroom when your eyes are ready for rest. In the second bedroom, you’ll find a full bed and a laundry closet complete with a washer and dryer. Both bedrooms are equipped with flat-screen cable TVs. 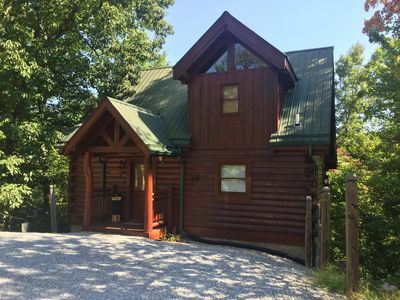 The cabin is ideally situated only minutes from town located near the Gatlinburg arts and crafts community, but far enough away for a private and peaceful retreat. Take a trip into town for a day of shopping, dining and live entertainment. 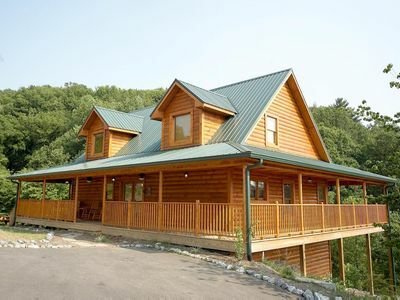 When you’re up for exploring, head over to Pigeon Forge, where you’ll find activities for everyone in your group to enjoy. Seek out a thrill at Dollywood’s Amusement Park or Splash Country Waterpark, take a trip through time at the Titanic Museum, take a hands-on approach to science at WonderWorks or experience the bustling entertainment center at The Island. 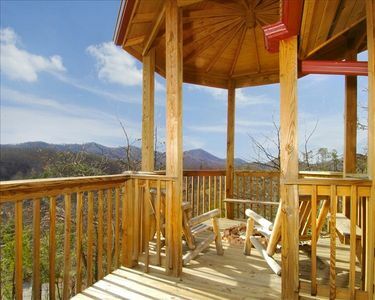 Get in touch with the great outdoors and drive out to Gatlinburg. 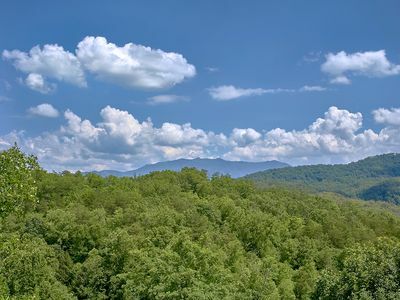 Venture into the Great Smoky Mountains National Park for a scenic hike or take a ride on Ober Gatlinburg Aerial Tramway to get a view from above. 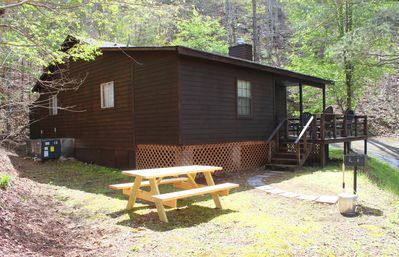 Secluded cabin only minutes from the Parkway!!!! 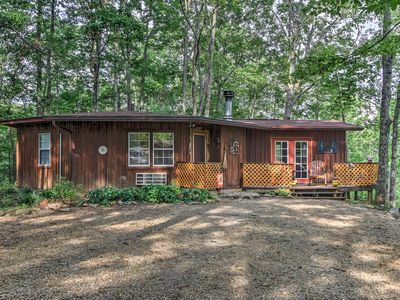 Storyteller Cabin -fire pit, dog friendly! 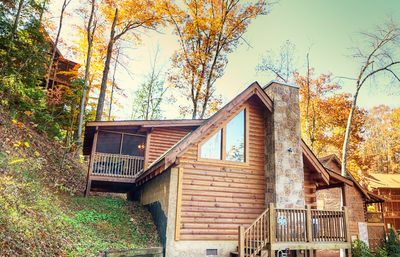 Unforgettable views in a beautiful cabin with private hot tub and shared pool! 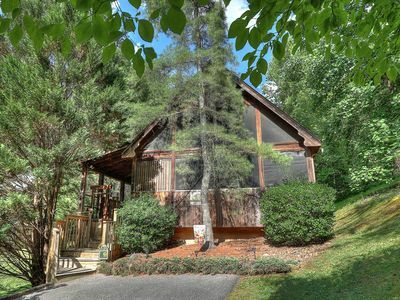 "Bear Den" is the place to unwind and relax while visiting the Smoky Mountains. 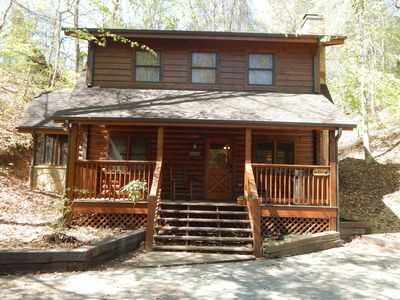 "Pooh Bear" is the perfect romantic getaway for Honeymooners, Newlyweds and Couple's getaways. 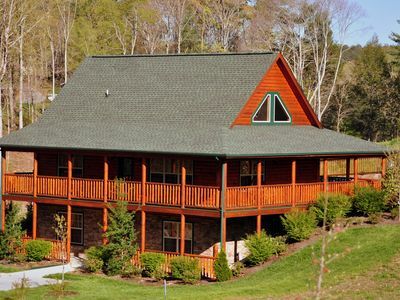 Save up to 20% on Spring stays-Pet Friendly Cabin w/Wrap-Around Deck, Game Room & WiFi.